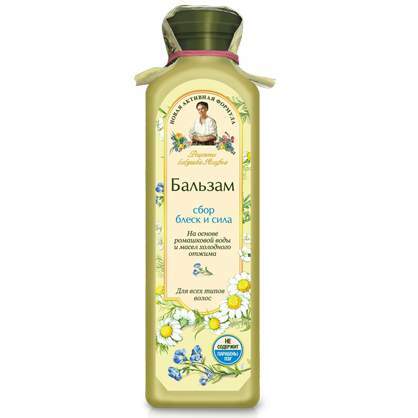 Strength & Shine Herbal Conditioner is produced by the Russian beauty brand Granny Agafia’s Recipes. The product is formulated with chamomile extract and other herbal ingredients. Chamomile extract contained in the conditioner is combined with other natural plant extracts (aloe vera, meadowsweet, vervain). These carefully selected herbal ingredients strengthen your hair and give it natural brilliant shine. The product is rich in cold pressed oils which protect your hair from harmful environmental factors and make combing easier. Directions. Apply a small amount of conditioner onto wet, clean hair. Spread evenly along the entire length. Leave for 1-2 minutes. Rinse with water. Ingredients. Aqua with infusion of Chamomile Recutita Flower, enriched by oils: Arctium Lappa, Red Juniperus Communit, Borago Officinalis; Extracts: Aloe Barbadensis, Spiraea Ulmaria, Rhaponticum Carthamoides, Verbena Officinalis; Cetrimonium Chloride, Cetearyl Alcohol, Guar Gum, Ascorbic Acid (vitamin C), Panthenol (vitamin B5), White Beeswax, Flower Wax, Tocopherol (vitamin E), Niacinamide (vitamin PP), Glucosamine, Citric Acid, Parfum, Benzoic Acid, Sorbic Acid, Benzyl Alcohol. Want to buy Strength & Shine Herbal Conditioner? Call us or submit your order via our web site!